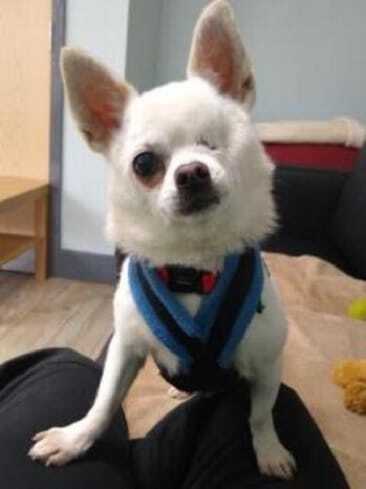 Donnie is an 8 year old Chihuahua who is at Jerry Green Dog Rescue in Boston, South Lincolnshire. Donnie’s favourite thing is to have cuddles, and he loves to be sat on your knee. He does enjoy a little walk but doesn’t go far. Donnie is clean in his kennel so the rescue are hopeful that he has the housetraining basics. Donnie could be left for 2-4 hours on his own and he travels well. Donnie is looking for a quiet home where he is the only dog. He is friendly with dogs out and about but doesn’t like to share his space with them. He could live with children aged 12+ and potentially cats pending an introduction. He has previously had an eye removed (the rescue don’t know the reason), but it doesn’t seem to bother him and is all healed up. He has had a dental while at Jerry Green and is neutered. Could Donnie be your new little friend? Please mention that you saw Donnie on the Oldies Club website.